Hello. Today I have more wedding photos to show you. 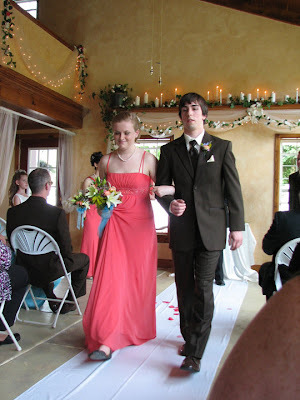 We are still waiting on the professional pictures, so these are just candid snapshots a friend took. The first picture is of my son Jordan and the grooms sister, also named Jordan, walking down the aisle after the ceremony. The wedding colors were 'Guava' which is a bright pink coral color. All the bridesmaids dresses were the same color, but different styles. It worked out really nice cause each of the girls got to pick out their own dress. 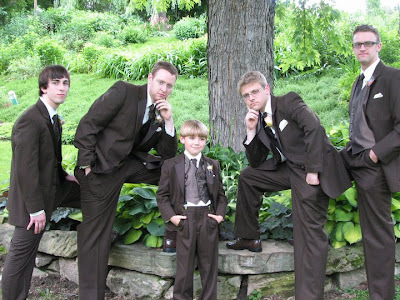 The groomsmen tux's were all chocolate brown and had a pin stripe in them. The accent color was 'Teal' which was in the dress I wore, the tie of the pastor, and in the ribbon and colors of the floral arrangements. 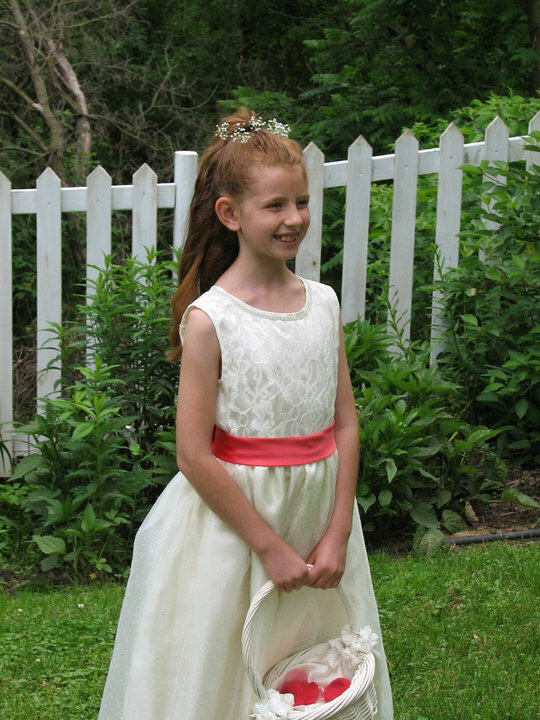 This is the flower girl 'Maggie', the daughter of a neighbor/friend who I went to Italy with. This candid shot was taken in one of the many garden spots in my yard. I made her dress myself using left over material from Ashley's Gown. The sash was purchased at the same bridal shop as the bridesmaids dresses. The flower basket was purchased at JoAnn's for $1.49 and was just a simple wicker basket. Ashley spray painted it 'ivory' and then my friend Leni lined it with ivory satin (also left over from Ashley's dress), and put ribbon and flowers on it. Here is Ashley and Jason with our ADORABLE Ring Bearer 'Brayden'. 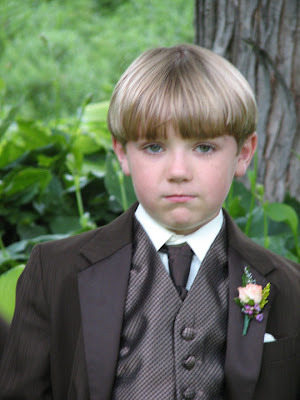 Do ring bearer's get any cuter than this? Love it! 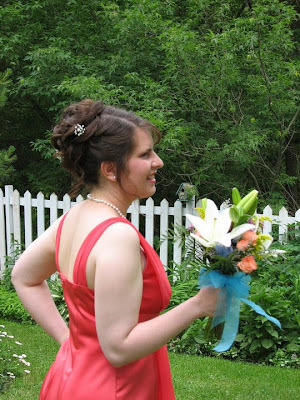 Ashley's bouquet was a mix of ivory lilies, and coral roses. 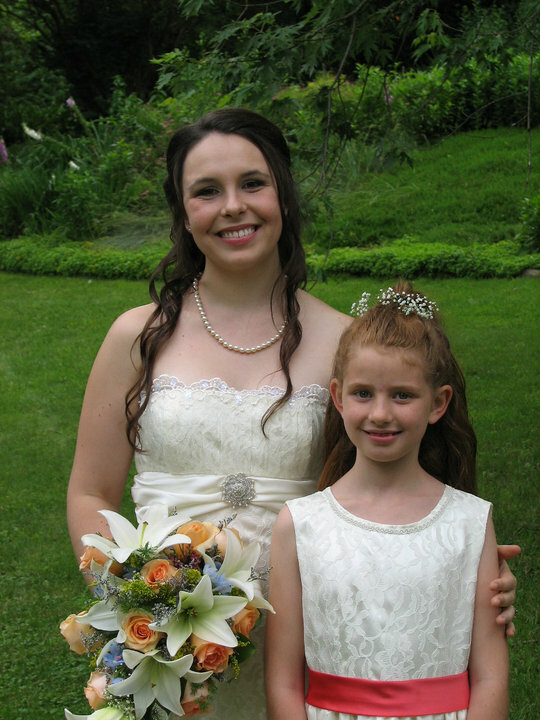 Here is Ashley with our sweet flower girl Maggie. She was the PERFECT flower girl! 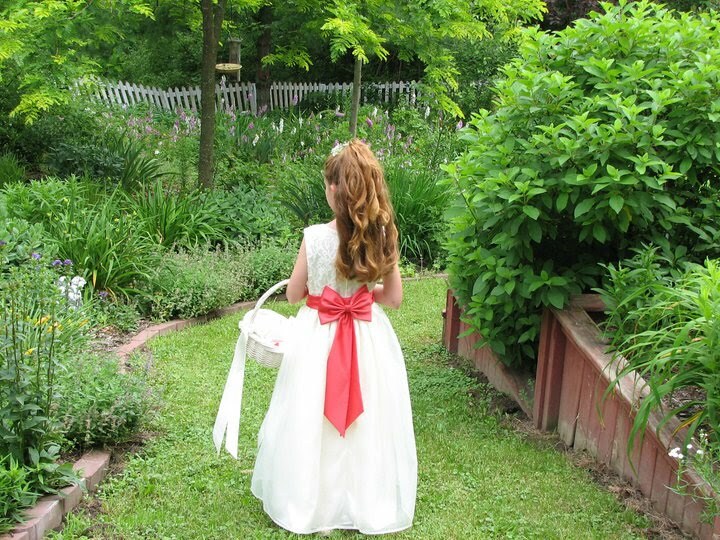 And here is a closer look of the flower basket and dress of the flower girl. This is Janelle, one of the bridesmaids. Baby's breath was put in all the bridesmaids hair by our wonderful friend and hairdresser Brenda. The bridesmaids bouquets were little bunches of flowers tied together with teal ribbon. All the arrangements had a natural wildflower, garden look. They were perfect for the setting of the wedding. And here's those crazy groomsmen posing around a ring of hosta under a big maple tree. The men are Jordan (my son), John (friend of the bride and groom), Brayden (the ring bearer), Jason (the groom) and John (the groom's brother). Someone is looking a little sick and tired of getting his picture taken. LOL! A farther away shot of the groomsmen and groom. 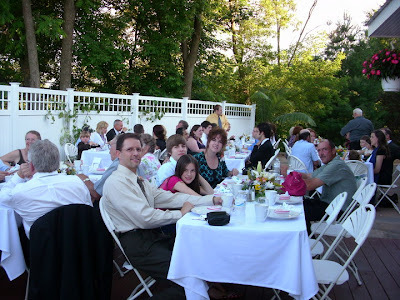 And finally, here is a shot of the reception held out on the patio our home. The family in the foreground are our lifelong friends Kirk and Shannon and their kids Brandon and Toria. Shannon was the photographer at the wedding and Kirk was an usher. I will continue to post more and more pictures in the weeks and months to come. Hopefully you won't get sick of seeing them! Beautiful wedding! 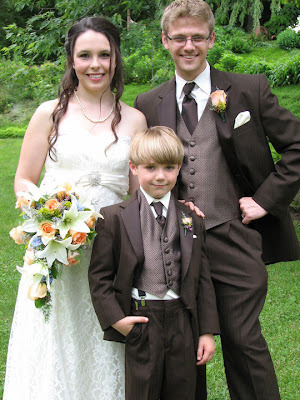 TFS your candid shots...they're fabulous and the bride and groom are beautiful! Beautiful photos! !....looks like a WONDERFUL wedding day! 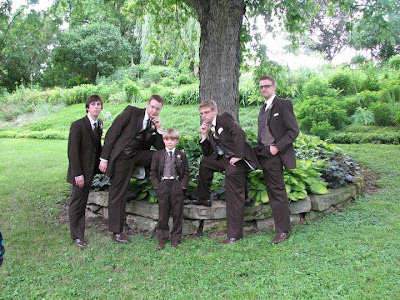 You really put a lot of thought into all the details of this wedding. Very nice photos. Beautiful photos! Your daughter had a gorgeous day for her nuptials!